Global Decompression, delivering Used Spinal Decompression equipment like the Axiom DRX 9000, North American Medical Accu-SPINA and Chattanooga Triton DTS equipment worldwide with minimal cost and rapid delivery. Ask about our 10-Day Delivery Guarantee, as well as our standard Equipment Replacement Guarantee. 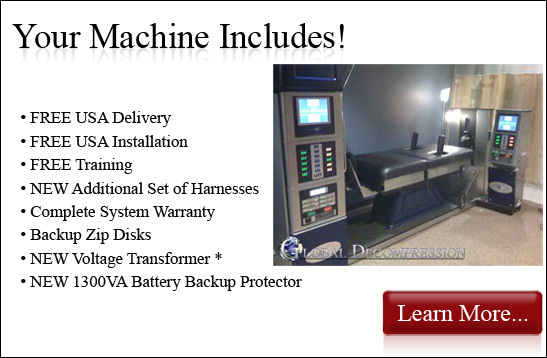 Global Decompression specializes in bringing you the latest spinal decompression equipment that is on today’s market. Like a used Axiom DRX 9000, Accu-SPINA, Chattanooga Triton DTS, or many of the other used chiropractic tables at the best prices we can offer. All systems include FREE delivery within the USA. Why pay full price for spinal decompression equipment when you can pay half price for a used Axiom DRX 9000, or a Accu-SPINA? What will you do with the extra 40k (or more) that you saved? We help you get the latest technology at the biggest discount; delivered right to your doorstep. We don't stop there. Global Decompression will install, setup, calibrate, test and even show you how to use your new spinal decompression machine. All included in the price. Axiom DRX9000 Service or Repair? 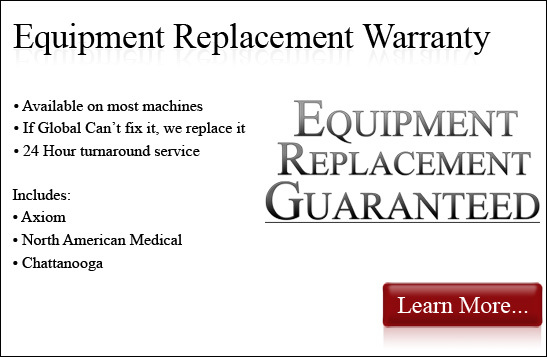 We guarantee our equipment. If the machine you bought from us cannot be repaired, we replace it.